Dive right in and give this sweeping adventure game a go! Publisher's blurb: "The Desert of Fire, the fearsome Aramla El-Nar, holds many secrets, a fiery waste which has swallowed entire armies and kingdoms whole. When their trade caravan is engulfed by a mysterious sandstorm, your Dragon-Marked heroes receive a call to adventure which may set them on their path to glory. Participate in all the romance, mystery, and adventure of the One Thousand and One Nights, with ancient magics, terrifying foes, and a forgotten betrayal which might change the world! 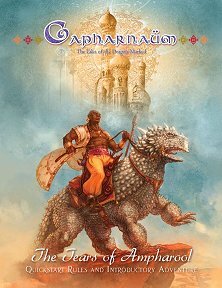 "The Capharnaum Quickstart: The Tears of Ampharool is a complete and playable introductory adventure for Capharnaum: The Tales of the Dragon-Marked, featuring an abridged set of rules, five pregenerated characters to get to playing right away, and an action-packed scenario spanning one or two sessions of play."